Everyone probably has some sort of food they would go back to when they are sick or exhausted (physically or mentally), or just don't have much appetite. At least I do. And in my case, it is definitely rice. Plain cooked Japanese rice, or rice porrige when my stomach is being sensitive, with some small condiments. I have mentioned this numerous times here, but he doesn't eat fish or seafood. Never, as long as he can recognize it's there (well, he does it a bit when he thinks he should). So I rarely cook fish at home. 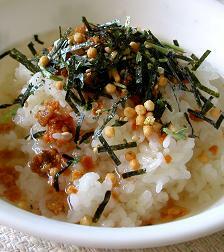 What I eat with a breakfast bowl of rice is store-bought condiments, usually from Japan. 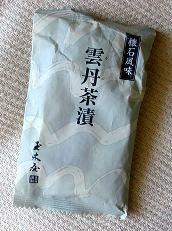 Yesterday I opened one of such products for breakfast, this time ochazuke. Ochazuke, literaly meaning "(soaked) in tea", refers to a dish of rice with some garnish (fish and/or pickles, seaweed, small rice puff, etc.) in a hot soup - sometimes it's green tea, sometimes dashi broth. 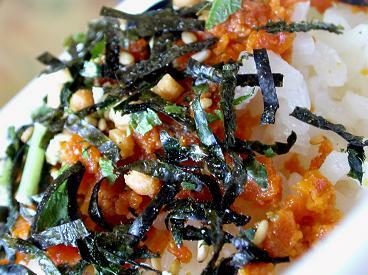 It is a typical quick and easy, light dish in Japan. But this one with sea urchin, from an old and established shop in Tokyo was one of their specialty "luxury" line of ochazukes, or so they claim. To be frank I hadn't really had so much expectations, but it turned out pretty good; dashi soup was tasty and the sea urchin was decent; I had never had sea urchin for breakfast before, even not pouch-packed semi-dried ones, but this one wasn't bad at all, specially when I don't have much access to traditional Japanese food products. For today I had something else, fishy again. 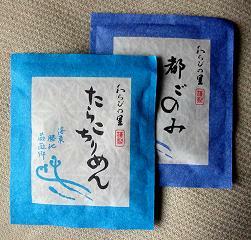 I got two kinds of chirimen-jako or seasoned dried baby sardines from another such establishment in Kyoto. One was with tarako or cod roe and the other with seaweed and shiso - I opened the tarako one first. I made the rice with tarako chirimen into a couple of small, 3-bite-sized onigiris or rice balls for a change; onigiris have something magical that makes the same rice taste better, or at least makes you think it tasting better, I guess. It's a silly thing, but it works for me. I've never had ochazuke with sea urchin, but I'm sure it was really good...at least it looks good in the photos. A few days ago, I had ochazuke with just green tea, umeboshi and shiso. That really hit the spot. Sometimes it's nice to have something plain and simple for a change. I thought the fish for Japanese breakfast always seemed a bit sad. Pregnant shishamo (sp?) or some poor fish halved and flattened. That said salmon is always great for breakfast and I love wasabi salmon ochazuke. 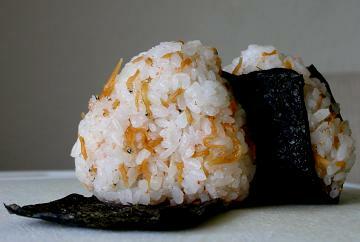 I don't know what the secret of onigiri is biut you are right. Reid - I had never had ochazuke with sea urchin, either! It's a bit unusual, for sure. Umeboshi & shiso ochazuke sounds absolutely divine to me, I very much appreciate something simple and good like that. I can try and get a yuzu-kosho for you when I'm in Japan the next time, if you can wait till early next year? I am continuouly amazed by how picky "he" is! Reminds me of "him" :) Don't you sometimes wish he would eat more variety? As far as I am concerned, I do!! !